Editor's Note: This post was originally published in April 2011 and has been updated for accuracy and comprehensiveness. This post was provoked by a call from a family friend, Kelly, who is considering launching a startup to provide non-medical, companion services in the home. Kelly knows that Ankota also provides software tools for Private Duty Home Care agencies, so she wanted to pick my brain about our experiences with companies like the one she is considering. At Ankota, we have the good fortune to be able to meet and talk with many home care startups. We definitely see trends in the market and have the opportunity to share some with you here on the Healthcare Delivery Management Blog. If you are reading this, odds are that you are already in the business of providing or coordinating home care services of some kind. Perhaps you are a home care provider, or are considering expanding your existing home health care business to include non-medical services. We're seeing rapid growth in non-medical home care, and the opportunities it presents for both new entrants and existing providers is compelling. Kelly’s call provoked me to think about the prospects of starting and developing a home care business such as this and prompted me to share parts of the discussion with our readers. Thinking of starting your own agency? Why not? It’s an attractive business model to which the entrepreneurial minded are drawn. Entrepreneur Magazine wrote an interesting article five years ago anticipating the opportunity. The piece provided some good “getting started” advice that still resonates today. You can read the entire article here. The National Private Duty Home Care Association (NPDHCA) and the Home Care Associateion of America (formerly NPDA) both provide a wealth of information on their web sites (click logos below to go to their sites). Both provide resources to help you with training and certifications and provide excellent research on the state of the industry and prospects for growth. It is worth spending some time on their sites to read about hiring practices, research existing agencies in your geography, and keep an eye on industry events. You should consider attending the associations’ annual meetings, too. Should You Franchise Your Home Care Agency? To Franchise or Not to Franchise… I won’t analyze here the merits of going it alone versus franchising, but would welcome comments on this post discussing the pros or cons of either. Franchising is definitely a consideration that anyone entering private duty home care should evaluate. If you know of a good article or other materials on this subject, please email the link to ken.accardi@ankota.com and we’ll be happy to repost it here on Ankota’s Healthcare Delivery Management Blog. For a free White Paper full of home care best practices, click here to download our Seven Habits of Highly Effective Home Care Agencies. We also suggest that you take a look at this blog article, How to Survive Year One When Starting a Homecare Agency from Ginny Kenyon. Differentiating your business is also a Best Practive that we suggest. And in that vein, Ankota has partnered with a new company called Triple Aim Technologies, that helps home care and home health agencies achieve the Triple Aim. 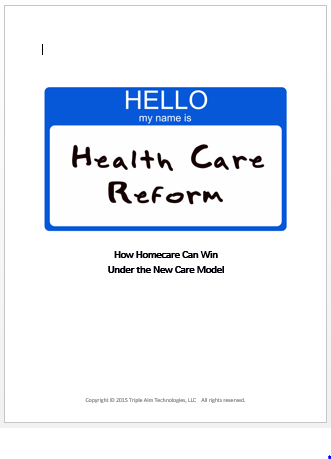 Click here to learn more about the Triple Aim and download a free whitepaper by clicking here: "How Homecare Can Win Under the New Care Model".